Behind the scenes, there are many people who help to bring this market about. Vendors don't just set up shop each week unannounced, there is a lot of work that goes on months, weeks, and days ahead of each market. Join our small, but mighty team and help bring the magic that comes with each Wednesday. Whatever your strengths, we have an opportunity for you. Find directions and information to participate as a vendor at the bottom of our Supporting Local Business page. Are you a professional photographer or just have a passion for capturing the moment? We love seeing the market from our customers point of view! Share your pictures with us in our Dropbox account, regardless of whether they came from your camera phone or your Nikon. Are you passionate about sharing your knowledge of different types of produce and inexpensive healthy recipes with others? Help our community expand their nutrition literacy by being a nutrition educator at market. There will be a resource table set up weekly with information about seasonal fruits and vegetables and recipes. You will need to complete a training with University of Maryland Extension's Market to Mealtime Program (dates TBD). Skills Needed: A passion for healthy living and the ability to interact with people of all different knowledge levels of nutrition. Interest or experience in the growing season and produce availability in Maryland and knowledge of budget friendly meals utilizing supplemental benefits is a plus. Thinking about a career in local foods? 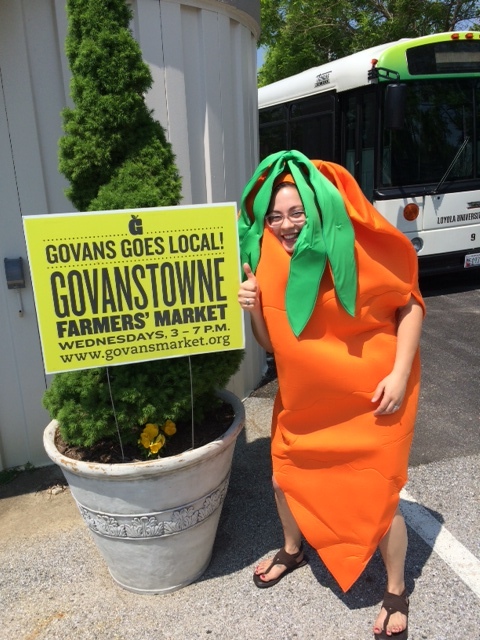 Work closely with local farmers and residents at the Govanstowne Farmers' Market on a weekly basis. You will be the right hand person to the farmers market manager and will learn how to run a market from behind the scenes. Duties will include: setting up and breaking down the market, helping vendors find their stall locations, assist customers with questions, help run the payment station and learn the different forms of payment, help with marketing and communications, help analyze customer and vendor feedback, help mitigate any issues or problems that arise, be generally friendly, helpful and attentive during the market. Skills Needed: A can-do attitude, flexibility, and great smile. It's not the easiest job, but you'll learn about the inner-workings of a small community market and meet all the people and friends who help make it happen. This is a weekly commitment and we need someone who will be reliable, passionate, and self motivated. If this sounds like you, contact the Market Manager at govansmarket@gmail.com to set up an interview. Some in-kind payment may be available. This is the main planning organization who directs the future of each market season. We have members who are local residents, non-profit leaders, food enthusiasts, and local farmers. If you want to help make this season better than the last, volunteer to be a part of the advisory committee. Meetings take place quarterly. Hit the streets, armed with tape and a stack of flyers to distribute to local neighborhoods and businesses surrounding the GFM. Take the business corridor, your neighborhood, or a local school/institution. People on the street will ask for flyers – engage and encourage them to check out the market. Prefer to stay close to home? Share details about the farmers market with your neighbors, better yet, pick up a stack of flyers from the market and distribute them while you’re out on a walk. Are you on Facebook, Instagram, Twitter, or Pinterest? Follow us and share our pages with your friends! Re-tweet, re-post, re-pin, and tag us! Do you live on a major road? Ask for a GFM Yard Sign to put on your lawn! Skills Needed: Almost anyone can be an Ambassador just by sharing info about the GFM! You'll need a good pair of walking shoes, a selling personality, a great smile and the ability to multi-task (taping fliers to poles is harder than it looks). Great for those who like to be active while volunteering and who want to get to know the neighborhood a bit more intimately. If you can't get out much, join our newsletter to stay up to date with the most upcoming community events and special information and share virtually with your friends and neighbors. Contact Marie at govansmarket@gmail.com to coordinate flyer pick-up or to learn more.